Synopsis: A young itinerant worker is forced to confront his secret extraterrestrial heritage when Earth is invaded by members of his race. Review: I love 1978’s Superman: The Movie. I figured I’d get that out of the way off the bat so you know where I’m coming from. Richard Donner’s big budget epic was bolstered by the tagline: “You’ll Believe a Man Can Fly”…and audiences did…in droves. Capturing the all-American charm of one Clark Kent aka Superman, Donner’s film successfully moved characters that had long lived on the pages of comic books and a television show to the silver screen with impressive results. 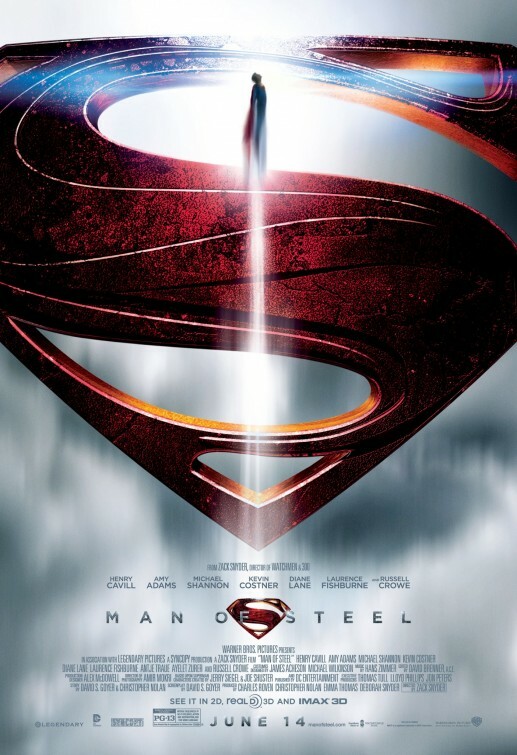 So perhaps it was a bit too much to hope that 2013’s Man of Steel could provide some of that same magic in kicking off yet another reboot of the superhero with a giant S on his chest. The trouble is that this updated hero is too aloof, too troubled a searching soul to mine any joy out of the proceedings. It’s a chilly film with precious little in the way of true blue charm and moxie. Instead, it’s largely a showcase for director Zack Snyder (Sucker Punch, Watchmen) to puff his special effects chest out and screenwriter David S. Goyer (Batman Begins, The Dark Knight, The Dark Knight Rises) to put a Bruce Wayne-style glum-ness on the picture. Perhaps that solemnity also comes courtesy of producer Christopher Nolan who successfully reshaped the Batman franchise into a lean and mean money making machine. What worked for Nolan and Goyer on the Batman films unfortunately doesn’t work here and mores the pity because several other key elements of the film are strikingly on point. Take Henry Cavill for instance. The Brit is possessing of a well toned eight pack to go along with his All-American features and cheekbones that could cut kryptonite. The script never allows him to emerge too far from his gloomy gus hole but there are moments especially near the end where we can see a glint in Cavill’s eye that brings a little Christopher Reeve to mind. In his newly redesigned suit, which does look better than the near neon colors in previous Superman films, Cavill is a convincing hero that has real potential. I also found a lot to like about Kevin Costner and Diane Lane as refreshingly earthy incarnations of Jonathan and Martha Kent, Superman’s earth bound adoptive parents that provide stability even when his powers threaten to overwhelm their found child. Most of their performances are relegated to flashbacks and much of the film is presented in a non-linear fashion as Clark wanders from job to job, only moving on when his powers put him in danger of being discovered. Costner has some of the best scenes in the film as he alternatively counsels his son and quietly fears for him if the outside world knew what he can do. I’ve often found Costner to be too mannered of an actor, always holding back what he’s really feeling but here he’s given nice material that helps him shine. The same can’t be said for poor Amy Adams (The Master) who is terribly miscast as ace reporter Lois Lane. Though it’s well documented she has auditioned/lobbied for this role on three occasions, it’s a shame she didn’t do more with the role when she finally got a crack at it. I missed the plucky verve that Margot Kidder to the role and it’s something I’m disappointed Adams didn’t tap into more – that being said she’s light years more interesting than Kate Bosworth was in 2006’s Superman Returns. I’m still not totally sure how I feel about Michael Shannon (The Iceman) as Superman’s main nemesis Captain Zod. Talking out of the side of his mouth and sounding like he has a Lifesaver he wants to keep under his tongue, Shannon is an unlikely choice for the role and even wearing a costume that looks like a hand me down from KISS he manages to give the character more depth than was probably necessary. Russell Crowe’s (Les Miserables) Jor-El can’t hold a candle to the “I can’t believe this works as well as it does” casting of Marlon Brando in Donner’s film but there’s a solid whiff of nobility given off by Crowe…and thank the Lord he doesn’t sing in this one. Snyder is known for putting a rich visual spin on his films and that’s what almost saved his disastrous Sucker Punch from being totally relegated to the waste bin. In Man of Steel the special effects gets the better of him though with too much of the film looking more cartoony than visually impressive. Sure, the flying sequences are solidly entertaining and some of the larger action sequences (including a much too long go-for-broke finale) look mighty fine but it only adds to a strange hollowness to the entire film. I may be a bigger fan of Superman than any other comic book character so I was very much looking forward to seeing where the next generation of Superman movies will take us. This wasn’t the movie I really wanted to see and that’s a bummer…but then I remember that I wasn’t totally taken with Batman Begins either when I first saw it. Time will tell if Cavill and company will find a way to truly take flight in their next outing but it’s possible that with more focus on the good and less on the glum a better franchise starter will emerge.